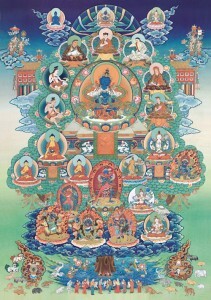 The Karma Kagyu lineage is one of the four major schools of Tibetan Buddhism. A lineage of direct oral transmission, it especially treasures meditation and, through interaction with a qualified teacher, can bring about the full and direct experience of the nature of mind. The Karma Kagyu methods were taught by the historical Buddha Shakyamuni to his closest students. These methods were later passed on through famous Indian meditation masters such as Padmasambhava, Tilopa, Naropa, Maitripa, and the great Tibetan yogis Marpa and Milarepa. In the 12th century, the monk Gampopa gave the teachings to the 1st Karmapa, whose successive conscious rebirths have kept the teachings alive and powerful to the present day. Today, great Tibetan masters such as the 17th Karmapa Trinley Thaye Dorje, Shamar Rinpoche, as well as Western teachers such as Lama Ole Nydahl transmit this unbroken tradition when visiting the many Karma Kagyu Diamond Way Buddhist centres around the world. Read more about the history of the Karma Kagyu lineage here.